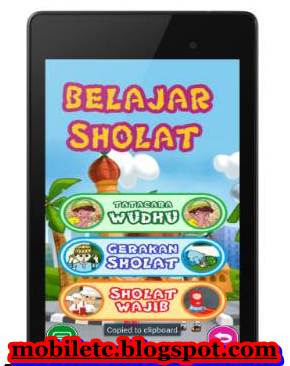 MobileTc - This is an application By Prayer and learn Prayers and Learn Ablution could help children to learn the way of Ablution and Prayer Movement Learning accompanied withprayers and readings in every movement. Many illustrations and pictures exist of his voice. Advantages and uniqueness of this application is any image and his voice can be substituted with its own private collection, according to the tastes and needs, so that the child becomes more excited and more quickly master the material. In addition, these applications are not large in size, so it is easily installed on any type of HP'S smartphone and tablet. This application is similar to that of similar applications from developers such as Learning Prayers, Prayers, Prayers of learning Guidance for the child, or the application of Marbel Learn the prayer which aims to introduce Islamic education to the child since early age. This application complements our educational collection of applications, like learning juz juz muslim prayer, study, and learning the alphabet and learning to read.